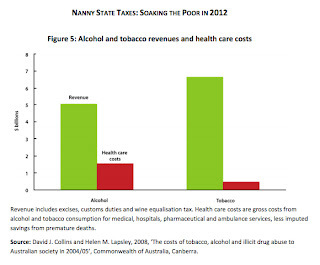 Smokers will cough up an extra $5.3 billion in tax to help the Rudd Government plug a huge new hole in its Budget. The unusual election-eve notice of a tax grab, adding $5.25 to the price of a pack of 20 cigarettes over four years, is being sold as a step up in the war on smoking-related cancer, which kills 15,000 people a year. Treasurer Chris Bowen will today announce staged 12.5 per cent tax increases, starting on December 1, aimed both at deterring young people from taking up the habit and helping to repair the Budget. To “stop kids smoking!” is their claim, to boost the budget is their aim; as bribing voters is their game, they’re totally devoid of shame. The Government’s nicotine fix will be a key part of an economic statement to be delivered in coming days. There has been an estimated $20 billion deterioration in the Budget since it was delivered in May. The razor gang has been looking at spending cuts and tackling tax breaks. Mr Bowen said the tobacco tax rise would be on top of regular indexation. That is untrue: my family hasn’t been touched by any cancer caused by smoking. Prime Minister Kevin Rudd, who said his mother was a non-smoker who died from passive smoking, said it was a leading cause of preventable death and disease. Mr. Rudd provides no proof that his mother died “from passive smoking”. Three years ago Mr Rudd imposed a 25 per cent increase in tobacco tax, adding about $2 to a pack’s price. Meanwhile, a product which is smoked by millions of Australians—cannabis, in the form of marijuana—is untaxed because it is proscribed. Unfortunately, the ban on all cannabis products means that hempseed—the most nutritious of all foods—and medicinal cannibis—which may cure many cancers—are also thereby prohibited. How much does smoking cost the country? Hundreds of millions, as the Prime Minister told us yesterday? $31 billion, as the ABC told us on the news last night? Is it a staggering $31.5 billion as news.com.au reported? Or about $35 billion as Latika Bourke told us at ABC online? The beauty of shockonomics is that no figure is ever too large to persuade a gullible reporter that is time to get serious about a perceived social vice. In fact if every smoker gave up smoking today it would cost the government billions of dollars in lost revenue, which far exceeds the expense of health care for smoking-related diseases. UPDATE III: according to the Labor-loving journalist (as well as former speechwriter for Australian Labor Party leader Bill Hayden, and member of the board of the Whitlam Institute), Alan Ramsey, in his book, The Way They Were: The View from the Hill of the 25 Years That Remade Australia (Sydney, 2001; p. 42), Kevin Rudd’s mother “died of Parkinson’s disease in 2004”. UPDATE IV: perhaps our duplicitous PM thought that Parkinson’s disease might be caused by passive smoking. K. Tanaka et al., in their epidemiological study, “Active and passive smoking and risk of Parkinson’s disease”, conclude that “No significant association” with Parkinson’s disease “was detected for passive smoking exposure”; however, “[e]ver having smoked cigarettes was associated with a reduced risk” of developing the disease. UPDATE V: see “Active drinking passive smoking”, and comments thereon, at Catallaxy Files. Mrs. Margaret Rudd, the PM’s mother, more likely died—with sad prescience—of the lamentable effects of catastrophic anthropogenic global warming and worrying over the certain influx of climate refugees. UPDATE VI: see “The mother of all shameless spinners” by Philippa Martyr at Quadrant Online. the company that manages the detention centres, Serco, has spent, on average, $1.4 million a year on tobacco products for detainees since the 2009-10 financial year. so I’ll tax junk food and drink. such a nasty, bad disease. from new taxes, dues or fees. though she’d never smoked at all. no more mothers will be lost! That would be your wife’s family, Mr Rudd. Rudd mentioned his mother again last week in the context of the government’s latest tobacco tax increase, which is driving the cost of cigarettes towards $1 per smoke. “I’m the son of a woman who never smoked in her life and she died of lung cancer, we assume through passive smoking,” Rudd said, which is an astonishingly precise diagnosis for a woman who lived to 84. Medical science can’t pinpoint most causes of lung cancer in the elderly. Rudd not only has that ability, but uses it to inform his taxation policies. As other commentators have noted, Rudd is very dependent on family history when it comes to government decisions. He’s previously cited his wife’s difficulties in obtaining a locally-built hybrid car for the government’s funding of so-called green technology. Who needs a cabinet? Indeed, who needs a whole party when the Rudds are an instant and on-call focus group?